Zoom, again, is the marketing name adopted by the Taiwan manufacturer Hsin Lung or HL it is believed because the name "Zoom" is more pronouncable and more likely to gain acceptance in the western marketplace. The Zoom concept has been credited to Will Herman, who was one of the original designers of the Girven Flexstem and arranged to have Hsin Lung manufacture sub-assemblies of the Flexstem. 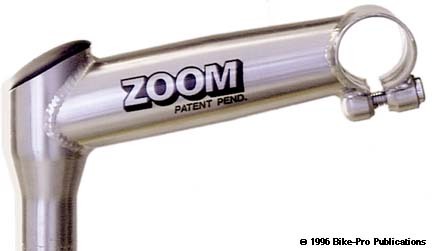 The Zoom Original is made of Cro-moly steel. The quill tube has a tapered outer diameter. In the area where the extension tube is welded to it, the diameter is 31.7mm, the lower section of the quill is tapered to the diameter required by the headset. This reduced diameter allows the expander bolt to be shorter which saves on some of the steel bolt weight. 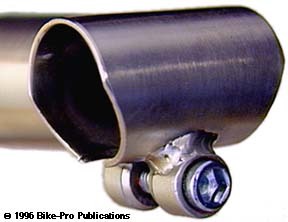 The extension tube is round but tapers as it moves toward the binder tube. The initial diameter is 31.8mm and tapers to just over 28mm by the time it's welded to the binder tube. The binder tube is made 1.37mm wall thickness tubing, cut to 41.5mm in length. Both the quill and binder tubes have holes drilled through one side, that are turned to face into the extension when welded to relieve and stress from the weld process. The binder tube has a cut away bottom, flaring from 29mm at the base to the full 41.5mm half way. The binder fitting is machined from steel rod, turned on a lathe to reduce the center diameter, round and cut the threaded end. The front of the fitting is drilled to make the cradle for the recessed bolt head and the passage way for the bolt. Once it's tapped for threads, the fitting is welded to the bottom of the binder tube, then the tube and fitting are sawn through horizontally to create the cinch mechanism. The binder bolt is made of chromed steel, 6mm x 1mm thread pitch, 20mm long, with a 6mm hex head and a 6gram weight. The expander bolt is made of Black steel with 8mm x 1.25mm thread pitch that is 100mm long (at least 13mm longer than necessary), has a 6mm hex fitting and weighs 34.5 grams. Within the wider upper half of the quill there is a circular machined aluminum wedge that cradles the expander bolt head and p[revents it from being pulled through the quill tube. The wedge is made extruded aluminum with machining in the form of drilling and tapping of threads. The wedge accoirding to the Zoom packaging is not to weigh over 10 grams, but even the smallest 1" accually weighs 17 grams. To close off the top of the quill tube HL Zoom provides a large press-in Black plastic cap. 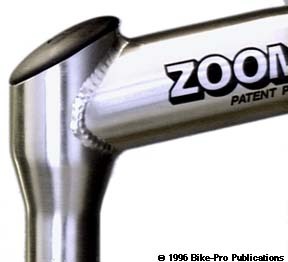 Zoom makes an Ahead version only in the 1 1/8" diameter in three lengths, 110mm, 135mm, 150mm. These are made of steel and available only in the Ti Grey color. Specify length.